Water views: Prime Beach Views. 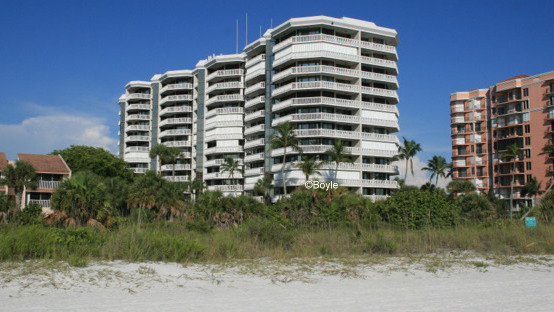 The Chalet is a beautiful high-rise property overlooking the Gulf of Mexico. Located at the middle of Marco Island’s beachfront, it is the perfect beach getaway. The ninety units each feature balcony access to all bedrooms, the kitchen and the great room. One can enjoy watching the sunrise over the city, as well as take in the breathtaking sunset over the water. From the comfort of one’s beachfront condo, pelicans can be seen diving for dinner and dolphins seen playing near the shoreline. The private pool area has direct access to the island’s white, sandy beach. Because Chalet is situated between the Hilton and Marriott hotels, residents and guests have access to prime beach amenities. These include umbrellas, chairs, jet skis and parasailing. If one wishes to be more active during your stay, the property features two tennis courts, a fitness center and shuffleboard courts. Other amenities include a covered grill area, activity room, covered parking and a sauna. Guests and residents have all they need to relax and play in Florida’s tropical paradise. Located at 520 South Collier Boulevard, the property is close to all that Marco Island has to offer. Chalet is just a short walk from shopping and dining at the popular Marco Walk Plaza. A short five minute drive takes one to Caxambas Park and Marina. From there you can take a boat ride through the Ten Thousand Islands and enjoy the pristine mangroves and other plant life native to Florida. A minimum thirty day rental period is required. Considering all the Chalet has to offer its guests, a month hardly seems long enough. Pets under twenty pounds are allowed with pre-approval. If you are looking for the ideal escape, Chalet has it all.